All writers follow a circular path as they develop an essay. 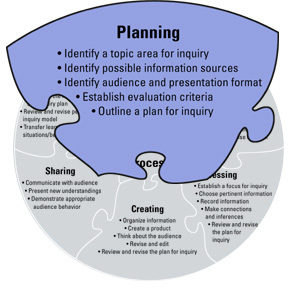 The Inquiry Model shown here reflects this path. In "Writing a Term Paper", several model essays are offered and two of the authors have been interviewed. The authors' responses will help students examine the text more closely and think about the way that the author planned, organized, developed, and wrote the work. Noelle Fraser: "Post-War Changes in Rural Alberta's Farm Communities". The term paper is a study of rural to urban migration as reflected in the Alberta town of Chipman. The essay, which was written for a university history class, is a well-researched and interesting paper that won the Henry Gerrie Ward Scholarship in Western Canadian History award. Disclaimer: "Post-War Changes in Rural Alberta's Farm Communities" has been written using the 4th edition of the APA Guide. It is the responsibility of the student to use the most updated version of the APA Guide. Alex Balogun: "Albertan Oil: A Vivid Past and Bright Future". The essay is a study of how the Leduc oil-strike in 1947 transformed Alberta 's stagnant post-war economy. Alex's guidelines for writing essays . Alex's essay outline . The following questions/answers derive from actual interviews with both authors. We follow the authors through the reflecting, planning, retrieving, processing, creating, sharing and evaluating stages of their writing. 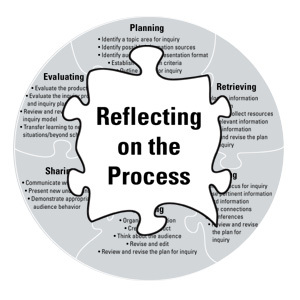 During the initial reflecting phase, you will think about the process you will follow in each phase of your writing task: planning, retrieving, processing, creating, sharing and evaluating. It's about understanding your thoughts and feelings during this inquiry process. What were your feelings at the beginning, middle and end? Noelle: I was nervous about sharing my first draft with my professors and classmates. I had never done that before. However, because of their input I was able to do the best work of my academic career. What strategies did you use to cope with feelings of being overwhelmed and frustrated? Alex: If I ever became frustrated with myself or had a mental block and couldn't seem to be able to get my ideas down on paper, I simply took a break. I took 10 minutes to get something to drink, and I made sure I didn't think about what I was writing. Once I got back to writing, my ideas became much clearer to me. Did you become aware of how you learned? (learning style) Can you elaborate for us? Noelle: I am an information-gatherer who enjoys doing research . I need to allow time for my thoughts to develop. My essays tend to be well-research with good content, but my writing style could use improvement. Alex: Before I began writing, I already knew I was a visual learner. Did you become aware of how about how you organized information? Alex: I did come to recognize how I organized information, in the writing of this essay. I don't mean by this that I went into its writing totally clueless, but I did organize all the stages of the essay in a specific way. For example, when I first started researching the topic, I printed off many articles pertaining to the subject. When I thought I had enough general research material, I split up the printed articles into three categories as defined by my thesis statement . I then thoroughly read through each category of research and highlighted key points. I also felt it was important to keep all the info in a central location so I used a simply duo tang to keep all the articles in. Noelle: Know your time constraints and be realistic. Start your research early so that you can get the best books. I cannot concentrate for more than four hours. I need to allow breaks. I like to have some snacks: Coke, salsa and nachos. I make sure that I have my bibliographic style guide, (APA Guide, MLA Style) favourite type of pen, pencils and lots of space on my desk. I like to write my drafts long-hand. What were your successes and frustrations? Noelle: Despite winning the scholarship, I still feel a bit insecure about this paper. It was difficult for me to reread it because there were many things that could be improved. For example, if I had someone proofread they probably would have found the grammatical errors, typos, etc. I should have allowed time for that. What new learnings have you come away with? Alex: I came away from this topic with a greater amount of knowledge about how oil affects our daily living as well as some key events of provincial and federal politics in Canada 's past. I also learned much about myself and strategies I use in all aspects of my writing. The planning phase is all about developing interest or curiosity. Once students establish a broad topic, they need to start thinking about the questions they want to investigate, as well as how they might find the information they need, and how they will present the information. It seems that the most successful student projects are those that develop from topics that are of personal interest to students. How will what I learn be of use to me later? What were my feelings as I worked through this phase? Was there an element of personal interest in the topic of your paper? Noelle: I am a fourth-generation Albertan. My great grandparents immigration to Canada from the Ukraine in the early 1900s. My parents were part of the generation who left the farms in the 1950s. This research helped me understand my history. Alex: There was definitely an element of personal interest in the topic. I believe it is crucial in anyone's writing for them to actually care about what they are writing. I have always had an interest in world politics, and I have come to know how critical petroleum is to our civilization. I also knew that Alberta is a major exporter of oil so I thought it would be intriguing to find out how it all began. Alex: I didn't complete a KWL chart specifically, but I did do something similar in my outline . In it I made all my headings into question form before I did any research and once I finished my research I answered the questions and formed my body paragraphs. I believe doing this helped me tremendously. How much background information did you have when you began your research? Noelle: Very little. A textbook mentioned that a "rural exodus" occurred in the Canadian Prairies, but it didn't provide any details. Alex: I had a decent amount of background knowledge beforehand. I was already aware of the role the tar sands could potentially play in the oil industry and one of my parents was seriously affected by the NEP back in the 80's. Did you write your questions, ideas and issues down? Noelle: For major essays I use a binder with loose leaf pages. For small essays I would use a small notebook. Alex: Yes I wrote those things down in my outline. Did you use a flowchart or a topic web to record your ideas? Alex: Yes, but only in the form of an outline with headings and sub-headings. I did it that way because it is the method which has worked for me in the past. What works for me may not be ideal for others. Alex: Mainly the internet. CBC had an excellent section in their website where you could watch documentaries and listen to radio programs of the time online. Those programs provided valuable insight into the subject. I also went to the library to find some articles on the topic. I felt it was important to use a variety of sources in my research. Noelle: Was there a mass departure from the rural Canadian Prairies? If so, when? Where? Why? What was happening in other regions of Canada? How does the topic relate to the history of Alberta? Am I keeping focus with my three main ideas? Am I structuring the essay in order to maintain clarity? 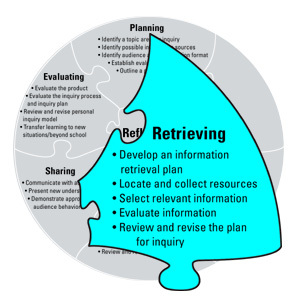 In the information retrieval phase, students consider the information they already have and what additional information they will need to gather. Students may well need to spend time exploring and thinking about the information they've found before they develop a clear focus. Where did I find the most useful resources? Will my topic focus still work? How did you start your search ? Noelle: Step #1. Identify tentative topic. Was there a "rural exodus" in the Canadian prairies. Step #2. Find basic supporting evidence. I looked for statistics that would support or disprove the population change. The numbers confirmed there was a huge drop, so I knew it would be worthy of investigation. The next step was for me to find the reasons for the decline. Look for Quick Overviews — I usually start by finding an overview by an expert in a specialized encyclopaedia (reference book). This step is helpful if you're unfamiliar with a topic and can lead you directly to the major writings. It's rather like taking the time to check Consumer Reports magazine before you make a major purchase. Your teacher or a librarian can help you find these. Look for Research and Writing Guides – I found a book called "Writing About Canada", ed. John Schultz. It contained a chapter by John Herd Thompson on "Writing About Rural Life and Agriculture." Step #4. Consider available resources: books, journal indexes/databases to find articles, maps, government information, newspapers, websites. Do you understand how information is organized in a library? Did this knowledge help you find information? Noelle: Yes. I would visit the Reference Desk at least three times for each major paper. I learned a bit more with every visit. It's important to learn how to use library Subject Headings, though I usually start by doing a keyword search . Once I've found a book that looks interesting I make note of it's call number. I also make note of the Subject terms assigned to it and start searching with those. Personal Author: Anderson, Isabel B. Title: Internal migration in Canada, 1921-1961 / by Isabel B. Anderson . Publication info: [ Ottawa : Queen's Printer, 1966]. Subject term: Migration, Internal– Canada . Subject term: Rural-urban migration– Canada . General Note: "This is one of a series of technical studies prepared as background papers for the Second Annual Review of the Economic Council of Canada, Towards sustained and balanced economic growth." Call numbers arrange books by subject, so whenever I'm retrieving a book I take a look at the other books on the shelf. To find articles published in journals (magazines) or essays in books, you need to use an Index or Database. I used America History and Life. The librarians can help you with this. It is often a two-step process. First you find an article, then you need to check if your library has the journal. Noelle: All of these are helpful. I usually start with keyword searching, then once I've figured out the library's subject terms I start searching with those. I'm glad you mention narrowing/broadening/synonyms – these are the keys for finding what you need. Libraries tend to use very broad categories. For example, a subject search for Alberta finds over two hundred books. Sometimes you need to browse through large lists to find something relevant. Alex: I definitely had a research strategy in my planning. I begin my research by searching for the general topic on the internet; in the case of this essay, "History of Albertan Oil". After I gathered some general knowledge about the subject I started to narrow down my search by searching for the main ideas as defined by my thesis. For example one of my sections was supposed to be about how the NEP affected Alberta 's and Canada 's economy. I found it important to find info about the extremes of any given topic; supporting the idea or undermining it. That said I would search for an extreme such as, "The NEP was stupid" or "NEP devastated economy". I would then search the opposite bias, something along the lines of, "NEP supported Canada " or "Trudeau NEP helpful". If I want to remain objective about a topic, I need to know where the bias lies in the topic. If I am having problems finding hits using certain words, synonyms can come in handy. Noelle: The paper was written in 1999, so there weren't many electronic resources available. If you want to thoroughly investigate a topic I think you must consider both. Many undergraduates like the convenience of electronic information, but be wary that most of your classmates will be relying on the same resources. I think most teachers and professors will recognize the extra work you do to find print and other interesting sources. Noelle: The University of Alberta Library has a checklist " Critical Evaluation of Resources on the Internet ." How did you find out how to write your bibliography or reference your work? (title, author, date, URL and date retrived? Noelle: The professors specified that we use the APA Publication Manual of the American Psychological Association. How did you keep track of the sources you used? Noelle: I had a binder with loose-leaf paper and used one page per citation . Though this may seem to be a waste of paper, it saved me time. I'd write the bibliographic citation information at the top of the page and follow with my notes. If the source wasn't useful I'd cross it out but keep it in case I came across it again. Alex: I found it easy to keep track of sources simply by making a rough document on which to copy the address bar of websites (URL). Noelle: Loose-leaf, use one side only in case you want to cut and paste. Highlighter pens. Alex: As far as search engines go, I used mainly Google and MSN . Wikipedia was also a valuable tool in my research. I also search the Edmonton Public Library system on epl.ca to find books and magazines. Noelle: The newspapers and agricultural magazines that I used did not have indexes, so I needed to browse through the entire newspaper to find articles. By doing this I got a sense of the major issues of the time such as highways, farm mechanization, electrification, etc. Alex: I never had to make any large changes, either in my research or my actual writing. I defined my topic and sub-topics clearly from the beginning of my outline and followed it nearly exactly. Were there big changes to your topic that had to be done? Refining? Noelle: I started with a tentative topic, to explore the rural population drop in the prairies. I initially focused on Alberta, but it was too broad to suit my purpose for writing. I refined my thesis by concentrating on Lamont County and the town of Chipman. For history it is also important to consider the question within a larger context. For me, that meant giving some statistics and information on other regions in Canada. 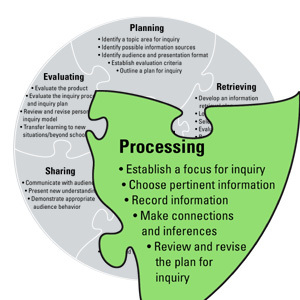 The Alberta Education Inquiry Model suggests that the processing phase begins when the inquirer has found a "focus" for the inquiry. It may be necessary to narrow the topic and develop a focus that can be expressed in a one or two sentence "thesis statement." From which format do I most easily gather information? How do I organize and sort my information? What was most useful in helping me determine my focus? What skill did I learn that will be most useful to me in later studies? Noelle, how did you develop this focus? Were you initially interested in post-war changes in rural Alberta, or were you more interested in writing about a particular community? Did your focus perhaps develop after you had done some initial research? Alex, how did you develop this focus? Were you initially interested in the topic of Alberta Oil and the Leduc oil-strike of 1947, or were you more interested in writing about the oil industry/companies? Did your focus perhaps develop after you had done some initial research? Alex: I was very much more interested in how oil corporations and oil-rich regions of the world affect our lives. I also already knew a little bit about the NEP because of my parents' past as well as some info about the Arab-Israeli conflict but nothing specific. When I learned the topic was Prairie history, I immediately thought of the topic of Albertan oil, before I did specific research. Did your instructor assign the topic or did you choose it yourself? Noelle: I choose it myself. Alex: While my teacher was very helpful in editing, I chose the topic myself. How would you summarize the focus of your paper? Alex: If I needed to summarize my topic I would say that the focus was aimed at answering this question. "How has Albertan oil affected our history as Albertans and Canadians, economically and politically?" Did you find any information that seemed confusing because it didn't support (or maybe even refuted) the focus of your paper? How did you deal with that? Noelle: Make a statement about the opposing viewpoints, state your position and provide evidence to defend it. Alex: I actually didn't find any information which didn't support my ideas as this is an informative essay, not argumentative. Noelle: I would photocopy articles that I found in newspapers or magazines. I'd use a highlighter pen and make marginal notes on the photocopies. I'd make sure I had all the bibliographic information on the photocopies. For books I would use post-it notes or keep the notes in my binder (remember to make note of where you are getting the information). Careful note taking is extremely important! Anytime you mention someone's ideas it must be acknowledged. Anytime you quote someone it must be acknowledged. Understand the difference between paraphrasing and plagiarism . Alex: Sometimes it is difficult not to plagiarize, especially when writing informatively. I got around this by paraphrasing information on the screen, onto a rough sheet of paper. I found this tactic very helpful in making sure it was my ideas going into my essay. Also, even though in this essay I didn't use them, I find footnotes to very helpful if I want to quote directly from a source in my paper. Did you find yourself having to go back and seek more information after you had created your first (or subsequent) drafts ? Noelle: My professors made suggestions. Alex: Only rarely, I had everything pretty planned out from the start. The kind of information I would go back for would only be for figures I had forgotten or didn't write down. Did new questions, issues or ideas emerge as you were doing your research? Noelle: When I began I didn't have a focus. Reviewing the local newspapers gave me the best leads. How has your understanding of the topic changed since you started your inquiry? Noelle: Every now and then I hear something on the news that makes me think of my essay. For example, the Chipman school closed a few years ago (2002?). I wonder if the gas station is still there. Rural communities are continuing to evolve and/or disappear. Alex: My understanding of not only the topic but many issues surrounding the topic has increased. For example, I learned much about OPEC and its relationship with the west, knowledge of new oil extraction technology as well as what that will mean for Alberta and Canada 's future. Were you pleased with your research strategies ? What would you improve the next time? Noelle: Spend less time doing research and more time writing. Did you include any graphs, charts and/or illustrations in your paper and how effectively did they present information? Noelle: I used to variety of formats: tables in the essay for statistics, appendixes included a highway map of Alberta, a map showing railways, historical advertisements, and I made some word documents to show the changes on Chipman's main street(not included here). What questions did you ask yourself? Alex: a) I believe the single most important question I asked myself as I was writing this paper was, "How are you going to keep focus throughout the essay of the topic of prairie history?" I found this question most easily answered by having my outline in question format. I knew if I answered the questions on my outline in each of my body paragraphs, it would give a lot of depth into the topic. Those questions also forced me to explain every paragraph and why the issue was important and complex; two things which will set your essay apart from the rest. b) I also asked myself, once I completed the essay, "What skill did I enhance most in writing this essay?" I would say the skill I most improved would be my organization in writing. I found it extremely helpful to have done so much planning beforehand (See prewriting). Since I had done this, that organization carried into my essay by helping me write with clarity and focus. The creating phase involves organizing all the information the student has researched and putting it into their own words. Why am I satisfied with my creation? How well does my creation address my focus? What other items can I consider to include or exclude from my creation? 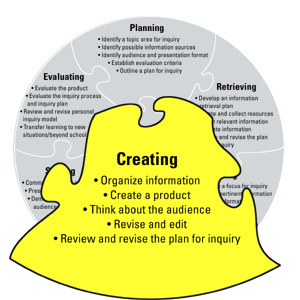 How did you organize yourself to combine and synthesize your many sources of information? Noelle: You don't need to start at the beginning. Since each paragraph deals with a separate topic you can start anywhere. Give evidence from your research (attribute the source – see bibliography) and show your understanding by commenting on it. Make sure you have a topic sentence and conclusion. Once you have a few paragraphs, start arranging them in a logical order and write linking sentences (see transition). I usually write my introduction and conclusion last because these paragraphs summarize the focus of your paper. They should not introduce new information. Was it difficult or relatively easy to organize your information and put it into your own words? Noelle: I think the key to success is finding the right balance between research, content (your thoughts), and writing style. You must focus on each of these. Did the materials you used present any challenges when the time came to cite them? Noelle: Sometimes I was missing information, so I had to go back to the original sources. It's important to make sure you keep track of where you found your information. The Publication Manual of the American Psychological Association (APA) has examples for the most commonly used research material. Noelle: This was a term paper so I spend several months researching/writing. The research/writing ratio would probably be 3 to 1. I think the writing was about 20 hours. Alex: I would say that I spent up to 60% to 70% on researching the topic and about 30% of my time writing the essay . Were you able to have someone look at your first draft ? Was this helpful? What were the strengths and limitations of your first draft? Alex: My first draft was helpful in being able to see all my raw ideas put down in a sentence structure. I did this draft the quickest because I didn't want to over think any of my ideas. (Free writing) I also had many holes in ideas and flow issues in my first draft, but I was able to recognize them and fix them for later on (see revise and edit). I believe it is of utmost importance to have others read my essay to get a second opinion. I had my SS30 teacher read and edit my first and final drafts, as well as my parents. What would I do differently in my next presentation? What strategies did I use to get myself ready for the presentation? To what audience did you write?Were you successful? Noelle: The audience was senior-level University. That means everyone had a background in history. My draft was presented to my classmates and the professors and I led a discussion. Everyone gave me feedback and I spent the rest of the term (3 months) continuing my research and revising the paper. Alex: Since this is an informative essay, the audience I was writing to would be the type of people who would read "Oilweek Magazine" or an article in Readers Digest. I did not write to make a point, but wrote in order for the audience to come to their own conclusions about the topic; hopefully written in an unbiased manner. Mounting an essay on this site is clearly a way of sharing; did you share the results of your work in any other way? Noelle: I gave copies to the Chipman Seniors Society, the farmer I interviewed, and to the sponsors of the Henry Gerrie Ward Scholarship in Western Canadian History. Alex: Yes, my SS30 teacher let me replace an assignment with this essay. Other than that I have not shared it with anyone else outside a school setting. Alex: Obviously the satisfaction of having others say it was well-done as well as a few extra marks in a course. 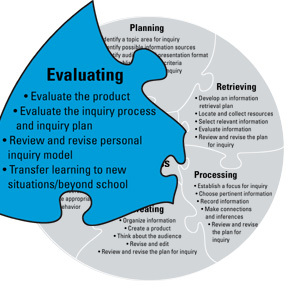 In the evaluating phase, learners should be able to understand and question the evaluation process, to identify the steps in their inquiry process, and to share their feelings about the process. What was the highlight of this assignment? Why? What did I learn that I can transfer to other tasks? (Noelle: Research, writing, organizational skills.) (Alex: "Looking back at the process I used to write this paper, I realize that the methods I used to can be transferred to any course which requires the presentation of information to an audience however large or small; whether it be in an English paper or a Physics project. The basic structure of outline, research, produce and edit (graphic organizer)can be used in many areas of education." Were you satisfied with the process of your inquiry? Noelle: I was surprised and flattered that I had been selected to receive the Henry Gerrie Ward Scholarship in Western Canadian History. It came as a total surprise. In March 2006 I saw an article in the Edmonton Journal about Professor Davidson at the University of Alberta . She's doing major research on the causes of ghost towns in Canada, so I know that I had hit on a topic worthy of further research. In their evaluation of my paper Professor Owram mentioned that the impact of school consolidation in Alberta would be a topic worthy of further investigation. Maybe someone can take up that challenge. It'd be great if my paper – with its flaws – can be a source of inspiration for someone. Alex: I was very much pleased with how I organized my methods of research and writing into a comprehensive project. Looking back and reflecting on your research and writing process, was there anything you'd do differently? Noelle: I would have spent less time on research on more time writing. Alex: I would have to say that in retrospect, I would not have done anything differently. I believe that you can't go wrong if you thoroughly research, plan and edit your essay. Was there anything about your topic that made your research particularly challenging? Noelle: The lack of secondary sources meant I needed to do more primary research . This takes more time, but it interests me. Alex: I didn't actually find this topic challenging to write about. Not being an argumentative essay, the presentation of my ideas went smoothly. How did this inquiry differ from others you have done in the past? Alex: This inquiry is much more in-depth and caused me to meta-cognize [sic] on a much deeper level. If you had one piece of advice to offer to other students doing similar work, what would it be? Noelle: Don't hesitate to ask your teacher, librarians, and members of your community for help and advice. And get someone to proofread your paper. Alex: The one piece of advice I would offer would be to make sure you design your essay so the topic you are writing about is important and complex, even if it isn't. Show both sides of the argument but remember to take a side. For example, if you want to write about the Kyoto Accord, don't only point out what it is and what its purpose is, state what implications is has on society and the economy and so on. A good way to implement this, I found, is to write from a variety of perspectives. For example, if I was writing about the Kyoto Accord, I would write through an economic and environmental perspective. Looking back on the process of your inquiry, on what phase did you spend the most time? Noelle: Retrieving and processing . APA Guide: the American Psychological Association provides a widely accepted style for citing references. The University of Alberta hosts a collection of various in-text citation procedures. Book citations include: author(s), title, publisher, date. Biography: telling the story of someone else's life. Brainstorming: the process of generating ideas on a certain subject; discussion and evaluation of ideas takes place once the list is complete and all ideas have been provided. Essay: a short piece of writing on a single subject – An essay may present the personal views of the author. "Essay" and " Term Paper " are interchangeable terms. KWL chart: a three-part chart that allows students to answer: "What do I know?, What do I want to know?, What did I learn?" Term paper: an original piece of work on a single topic – A term presents subject matter that is related to a course of study. (applying new concepts, theories) " Essay " and "Term Paper" are interchangeable terms.